Wild Hunt by Erik Henry Vick is the kind of stuff I love to read; bold and wild, the kind of fantasy that creates worlds in the reader's mind. Hank Jensen sets out to save his family, and that is all that matters. At least, this is what he tells himself. But saving family plunges him deeper into a complex battle, one in which he faces vicious and powerful enemies, monumental challenges and obstacles thrown at every step of the journey. He has quickly realized that it wasn't just his family that was at stake, but the fates of Mithgarthr and Osgarthr. Does he have what it takes to keep control of the Rooms of Ruin and save the world from imminent oblivion? The third entry in Erik Henry Vick's epic fantasy series possesses an originality that is fascinating and I enjoyed the world-building. The setting features well-imagined landscapes, images that suggest magic and the supernatural — there is even a magical feel to the names of characters and places. Fast-paced, and told in an engrossing narrative voice, Wild Hunt becomes a gripping story packed with intense action. It features characters that readers want to stick with, from mythical creatures to unforgiving villains and a hero forging a path through the impossible. The writing is superb, tight and crisp, with beautiful descriptions that are punctuated with exciting dialogues. The deft handling of conflict is one of the things I enjoyed in this book, and I was keen to see how the protagonist evolved as the conflict escalated through the narrative. Wild Hunt is strong and phenomenal, characterized by physical clashes between powers, yet there is a deeper level of conflict, especially the one taking place in the protagonist's mind that adds to the strength of this narrative. A great read, indeed. Wild Hunt is a work of epic fantasy fiction written by author Erik Henry Vick, and is the third book in the Blood of the Isir series. Taking on fully graphic dark fantasy and raising it to its most violent and thrilling heights, we meet our typical fantasy hero Hank Jensen as his mission of family rescue is completed, whilst all hell is literally let loose. Hank is on the trail of Luka, a dangerous being who has untold powers, and during this latest quest, the stakes couldn’t possibly be higher as the fate of all realms hangs in the balance. The story of Hank’s quest so far is easy to pick up, even if you haven’t read the previous books in the series, and I was immediately immersed in a dark and terrifying world of monsters, demons and simple folk trying to survive the chaos. Hank is a classic hero straight out of mythology himself, a humble man trying to do what’s right and learning new abilities and making allies along the way. Fans of the classic mythologies and the new classics such as Tolkien are certain to enjoy author Erik Henry Vick’s updated but faithful storytelling style, with over 700 pages of epic concepts and vivid battles to get their teeth into. 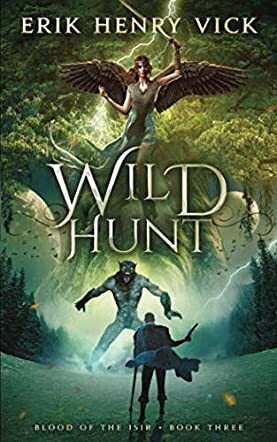 With its strong narrative, powerful imagery and winding, quest-by-quest structured plot, this mixture of horrid beasts and epic strength is certain to please, and I’d definitely recommend Wild Hunt as a must-read for any fantasy fan. Wild Hunt by Erik Henry Vick is the third book in the epic fantasy series Blood of the Isir (and considering the scope and length of the different volumes, it’s one series that doesn’t just call itself epic for fun). Hank has been through a lot in the first two novels, and you’d think life couldn’t get much worse for him. Well, it can and it does. Hel and Luka escaped, and while on the hunt for Luka, Hank finds out that there is much more to lose than he ever imagined. It isn’t even about the worlds of Mithgarthr and Osgarthr any longer. Much more is in danger. But will Hank have a chance against such ancient powers, even with his new friends? The one thing I liked about Wild Hunt by Erik Henry Vick (and the whole series) was that it was a nice, LONG read. For some, it might be too long, but I liked all the details, the detours, the mythical stuff, the adventures – small and big. It was a great experience to be with the same characters for a while. You get to know them, love them, hate them, or find them a bit annoying – sometimes you might feel all of it for the same character. The mix of characters in this fantasy series is great. I found some of the exotic names a bit hard to understand, and wouldn’t quite know how to pronounce them, but that’s about the only problem I had with the novel. It’s difficult to write a review about the third book in a series without giving away too much, especially for readers new to the series (a word to them: start with book 1, otherwise you will miss out on a lot of fun). All I can say is that it’s a read I have enjoyed a lot, as there was a captivating mix of action, quieter moments, some humor and some characters that are just awesome. As someone who also suffers from chronic physical pain, it was great to see a hero who wasn’t perfect but rose to meet the challenges that were thrown at him, especially in book 1, even though there was so much pain. What a journey! Well done!